All Submittals, Fabrication and Manufacture, Product Delivery and Storage shall be made in accordance with Project Specifications. Required samples of solid surfacing should be submitted for review and Engineers approval before proceeding with the work. The samples shall show color, finish and details of edging, forming etc. All joinery shall be kept covered during transit and kept clear of the ground at the Site. It shall be handled and stacked carefully to avoid damage. Components shall be staggered or separated with spacers as necessary to prevent damage by and to projecting ironmongery, beads, etc. During transit. All the materials / components shall be wrapped carefully and ensure protection from scratches and other damages. Polythene as a base and corrugated carton may used as a top packing. The store on site shall be clean, dry area. All products shall be protected from dirt and risk of damage from other trades working like False/Ceiling works, Flooring, Plaster, Top Coat for Walls, and Tiles Works etc. Humidity on site should be within the range during storage and installation on site. 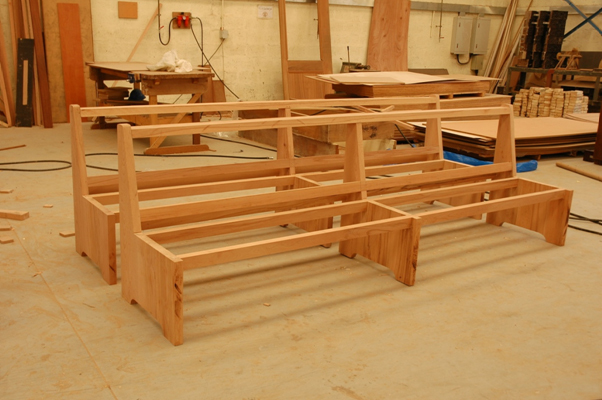 All products shall be stacked level and flat, on timber support covered to avoid marking on the finished surface. There shall be three such supports equally spaced, one across the canter and one 300mm from each end. Condition of Temperature and humidity during storage and installation shall be as close as possible to those expected in the occupied building. After installation there shall not be sudden or extreme changes in temperature or humidity. Storage and Installation temperature shall be 20 to 30 on site. Proper Labeling shall be done to identify the product on site. It will include Product location, Size and Project Name. Cutting and preparing wood as per approved shop drawings using basic machinery after checking the moisture content by reliable calibrated meter. Squaring the Raw Particle board by beam panel saw to ensure the size. Pressing Beech veneer two sides by hot press using hot press (waterproof) glue. Assembling frame by dovetail connection by F9 machine. Smoothing and preparing surfaces for Painting. Filling surfaces defects using Natural Putty Filler. Staining color by solvent base stain. Spraying on coat of Polyurethane wood sanding sealer. Fix the in tumescent Strip to the door leaf. The mock-up of different types of doors and joinery works shall be made at site as per the site conditions if required. Specification and approval of the Consultant shall be confirmed prior to installation. The Site Engineer/Site Supervisor should ensure that the area is ready to install wooden doors and joinery works. Approved materials with proper MAR and approved shop drawings shall be all available prior to start the work. Installation of wooden doors shall be carried out as per the approved method statement and shop drawing. Early preventive action can be done easily during the work progress in coordination with site staff. Ensure the door openings are as per the door schedule. Position the Door frame as per the approved drawings. Adjust the door frames if there is any variation. Alignment and verticality & horizontal shall be also need to verify and any deviation shall under the required tolerance as specified in the project specification. Fix the frame with Screws as per the approved shop drawings. Hang the door leaves by hinges which is approved as per the specification. Fix the archwirave on wall to the frame by adhesive (approved material) and steel clamp. Fix the ironmongery and accessories in accordance with manufacturer instructions. Fix Glass Vision Panels as approved Material and Shop Drawings. Check to confirm the fixed doors are as per the approved drawings. Use the approved paint for final touch up if there are any damages. For all fire rated doors site fitment conditions and requirement shall comply the fire rated door global assessment report. All the material and accessories shall be as per the approved drawings. WIR should submit to the consultant for the inspection of wooden doors for approval. Any inspection comments from the CONSULTANT shall immediately address by the QA/QC engineer to the responsible site engineer for immediate corrective action. Once the comments are done, QA/QC engineer should inform the CONSULTANT to proceed. Site engineer shall confirm the specification and standards are followed as per the site requirement. Ensure all the materials are as per the project specification. Review all the approved materials documents and shop drawing prior to start the work. Installation shall be done in comply with all the project specification. Remove any scratches or stains after installation. WIR should be submitted to the CONSULTANT for the inspection. Any inspection comments shall be immediately addressed for corrective action. Cleaning and covering shall be done after the installation as per the project specification.